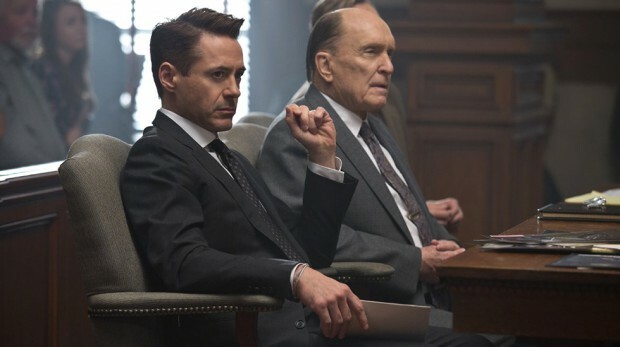 Less a courtroom thriller than a family melodrama with some courtroom scenes, The Judge gives Robert Downey Jr. the opportunity to flex his acting muscles without having to don a robot suit. Hot shot lawyer Hank Palmer (Robert Downey Jr.) returns to his home town and estranged family after the death of his mother. When his father (Robert Duvall), a respected judge in the town, is accused of murder, Hank must uncover the truth and solve those family issues that drove him away all those years ago. At 141 minutes The Judge is definitely bloated, it’s script handling a large mishmash of family drama clichés. Yet the reason The Judge doesn’t feel like it drags (well… too much) is the power of the two principals. Robert Downey Jr. might just be doing his same shtick that he always does up on the screen, and in truth there is very little to separate the charismatic, brilliant and overly cocky lawyer Hank Palmer from the charismatic, brilliant and overly cocky genius/ billionaire/ super hero Tony Stark – but Downey is so charming and damn watchable that it doesn’t really mater. Throw the bluster of Robert Duvall into the mix, in a brave role as a strong, imposing figure stricken by disease and unwilling to accept his own frailties and failings, and you have some prime drama in the making. Fortunately it is this father/son frisson that is the centrepiece of The Judge. As both Downey and Duvall struggle with this relationship they produce some quite dynamic cinema. True, this often reaches a level of intensity that borders on melodrama, but it is enthralling enough to watch these two actors bounce off each other, that it is forgivable. In the quieter moments there is actually something moving in the performances that give the film a genuine emotional resonance. By contrast the rest of the excellent cast get somewhat short shrift. Billie Bob Thornton is given less of a character, and more of a guy with a cool prop, to characterise an adversary for Downey’s court room shenanigans. Vincent D’Onofrio and Jeremy Strong do their best as cardboard cut-outs of siblings. Vera Famiga has some fire in her performance as the ex-girlfriend, but is shot in such soft focus as to be barely recognisably human. Still, they all do the best with the little they are given, and provide fine support. The fact that David Dobkin’s (Wedding Crashers) first attempt at a dramatic movie circles mawkishness, but never quiet touches it, is purely due to this fine casting. The Judge has the vague whiff of Oscar bait about it, but lacks any finesse in execution, hitting those emotional notes too hard and demonstrating little subtlety to be in any serious contention. The end result is long, obvious, but still somewhat enjoyable in it’s own right.